2. Open the Newsstand app on your tablet’s main screen and tap THE WOLVERINE cover. These instructions are for subscribers that purchased directly from The Wolverine/Coman Publishing for print and/or digital delivery. See the second tab for subscribers who purchased through the newsstand app (Google or Apple). NOTE: that you will only have access through the app (not computers or other devices.) 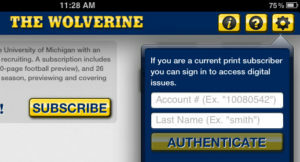 For cross-platform access, subscribe directly with The Wolverine. NextIntroducing The Wolverine Magazine App for iPad!